Cranleigh is situated in the county of Surrey and is reputed to be the largest village in England. Originally spelt Cranley the name was changed in 1867 by the Post Office to avoid confusion with Crawley in Sussex. There is a 12th century church at one end of the High Street and a cricket ground at the other. The village boasts a wide variety of local independent shops together with four churches, four banks, three supermarkets, a post office, several estate agents and charity shops and a good choice of cafes for breakfast, lunch or tea. 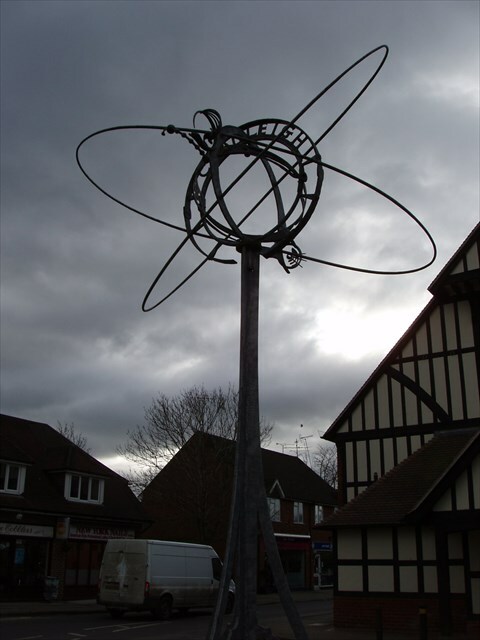 This village sign was erected outside the Village Hall to celebrate the Millennium. The photo was taken on a rather dull day which does not do the sign justice or make the village look very inviting so I will replace as soon as possible. First find the initials of the sculptor from Forest Green Forge. Using the standard A = 1, B = 2 etc convert these letters to A and B. Then similarly using the month that a capsule was buried here convert the second letter of the month and call this C and call the fifth letter D.
Finally the year that the capsule was buried becomes EFGH. Congratulations to hofficoffi on FTF!